April 2016: Our Car Club! If Suncoast Diecasters were a WWE tag-team, this would be our entrance theme — and Ya can’t. Teach. That. And, since you can’t teach that, on to the photos! 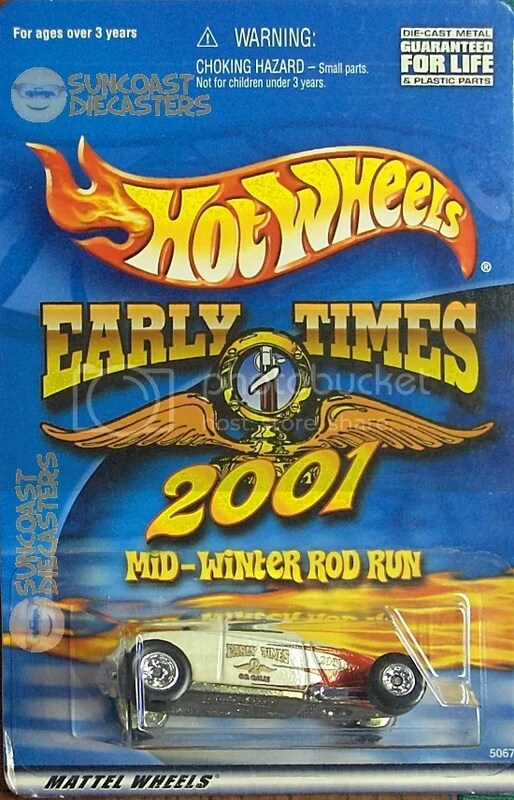 Ken nabbed this groovy Sooo Fast done up in custom livery for the Early Times Car Club. Everything about this is great to look at, but my favorite element is the retro MotoMeter illustration. 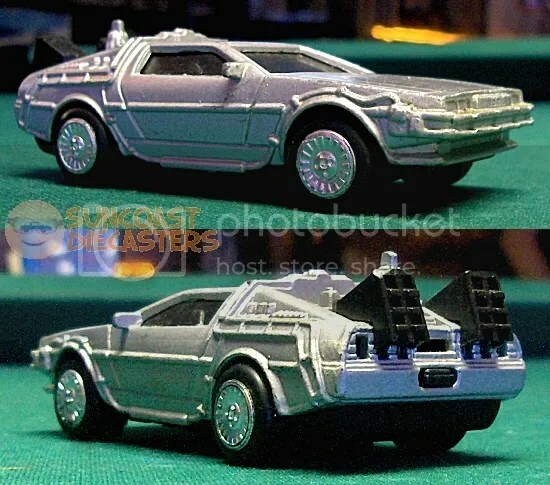 From Big Tractor Mike I bought this awesome large(r)-scale DeLorean DMC-12 Time Machine. Can’t tell whether its motor is pull-back or friction, as it doesn’t work anymore. But that honestly is quite irrelevant, as this big(ger) beast looks great just sitting on the shelf. 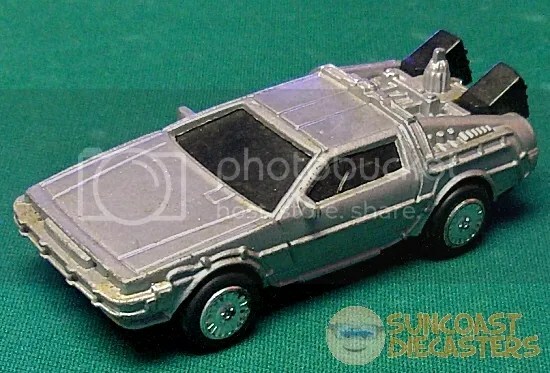 Based on the length of an actual DMC-12, and doing a little math, this model is about 1/43-scale. Now, here’s a curious thing: I don’t know the toy’s maker. 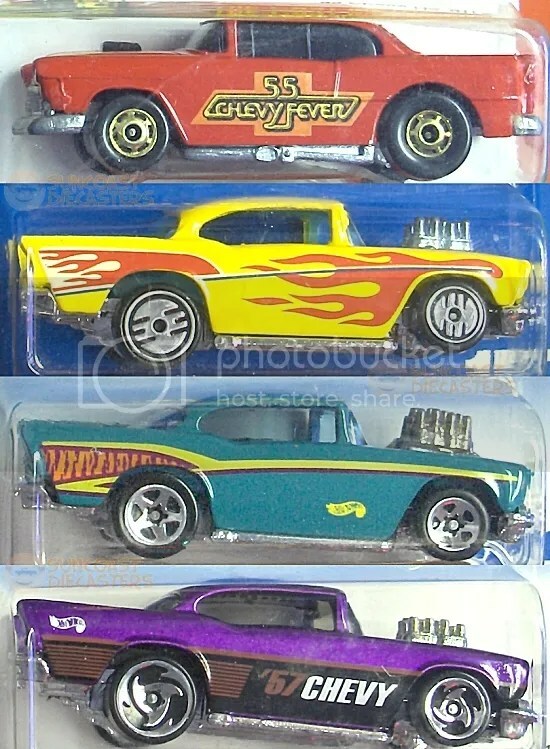 I’ve seen any number of regular production vehicles, both modern and classic, reproduced as friction/pull-back toys. But this is not a regular production vehicle; this is a licensed design owned by a major studio. 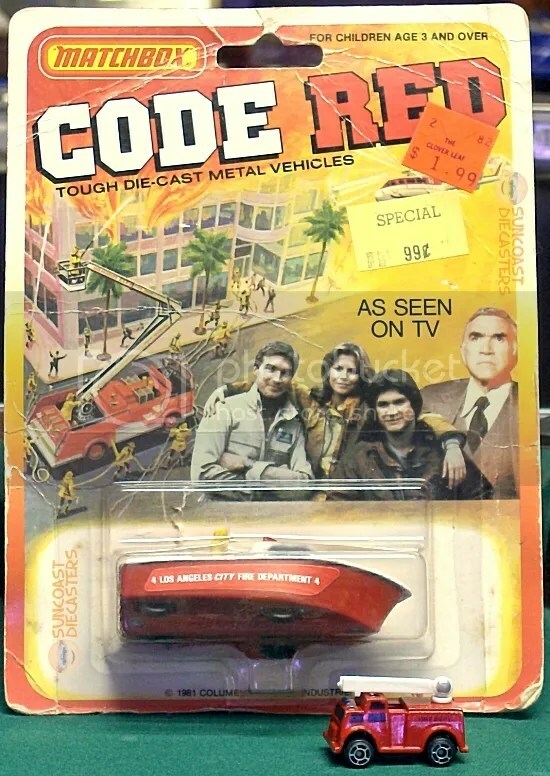 You’d think the toy’s manufacturer would proudly want its name or logo on the base; but it only states Back to the Future and Made in China. 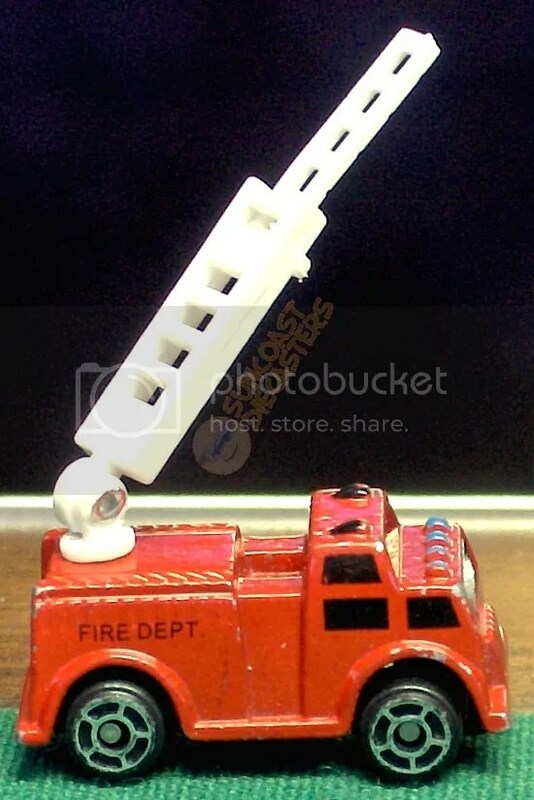 This is simultaneously one of the most readily recognizable toys and a no-namer. 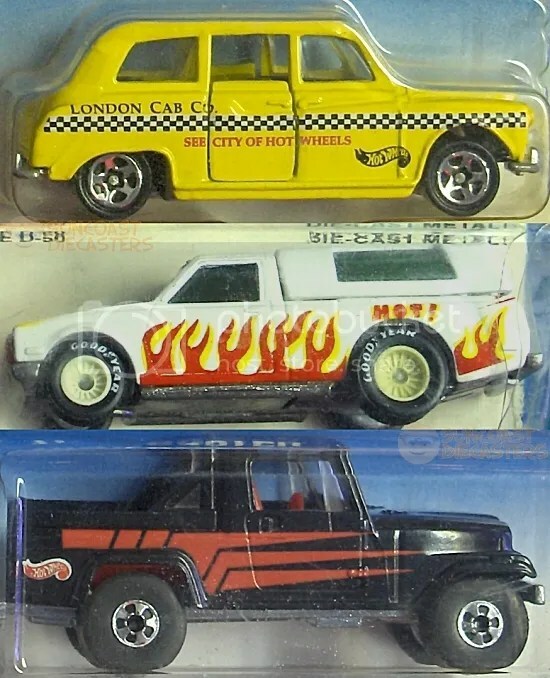 Next is the “Delivery Vans” group. And, yes, the blister over the first Dairy Delivery really is that yellow. Mike also picked up two Early Times-edition rides. And, no, I didn’t cheap out and just copy the photo of Ken’s Sooo Fast. Look closely, and you’ll see they’re two separate cars. 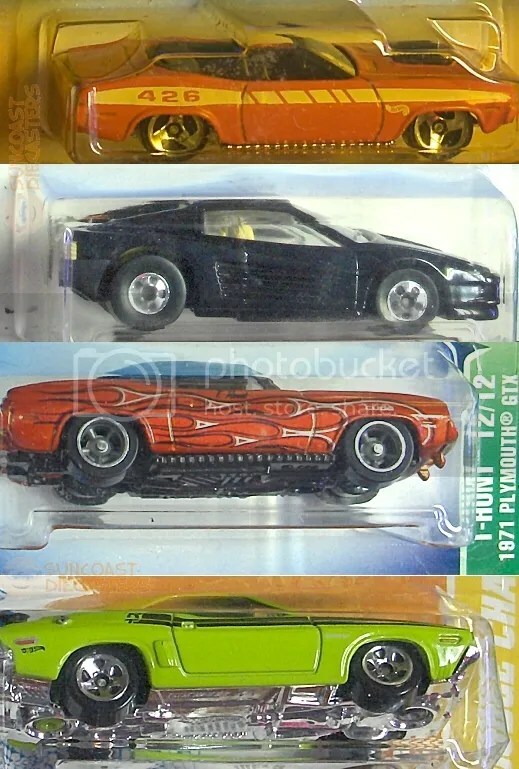 And finally, the Best of the Best: A nice tall, refreshing stack of Treasure Hunts, including a ’67 Camaro with an opening hood (which itself is a refreshing treasure). Ed, a retired fireman, acquired his own trio of flamey greatness. First is this VW done up in German (!) fireservice livery. As you can see, it’s by a company named Vitesse. 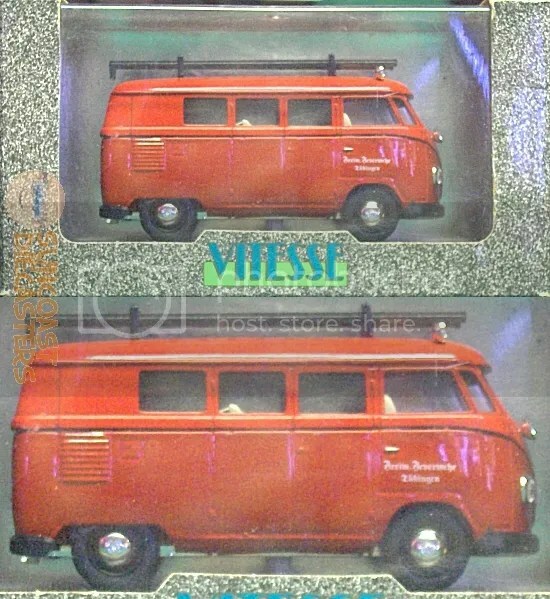 The back states the toy was manufactured in Portugal (and Vitesse was based there), which piqued Ed’s curiosity as the primary langauge on the packaging is French. I suggested (quite incorrectly, it turns out) that French might be the official language there. By the way, Vitesse has an office here in Florida. 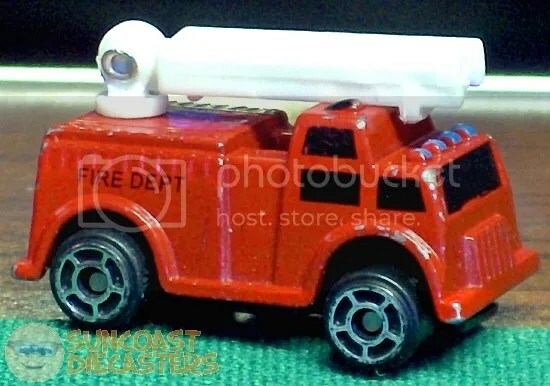 Next, Ed got what has to be the most adorable li’l fire engine I ever did see. 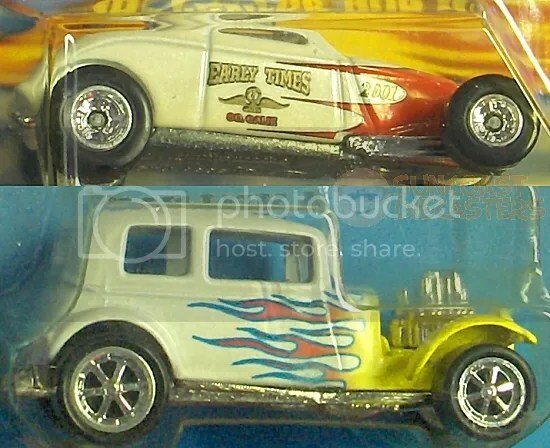 No, it’s not a Micro Machines product. It’s by a Hong Kong-based company named Soma, from their Micro Racers line. 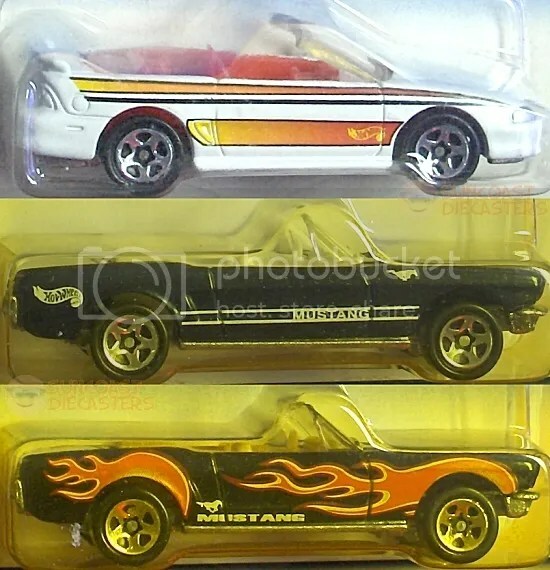 I was able to ID it on their “sell sheet”, which is a huge (1600+ x 2300+) JPG. Finally, Ed got this cool retro TV toy. This is a variation of the Police Launch. 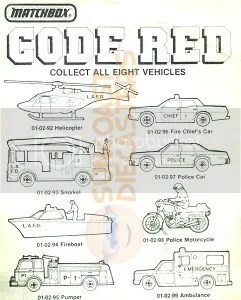 After Battlestar Galactica and Galactica 1980, Code Red was Lorne Green’s next series. It ran for two seasons, as did BG, and obviously garnered some licensed toys, as did BG, so technically I guess the two shows were equally successful. (Yet, there was no much-hyped Code Red reboot on SyFy. Strange.) The vintage price tag reads “The Clover Leaf”; I couldn’t any info on that store, so feel free to inform us in the Comments. For its retro TV-ness, its LorneGreenness and vintage priceyness, I gladly dub this our Find of the Month(*) for April 2016. Awww, it’s the cutest photobomb ever! 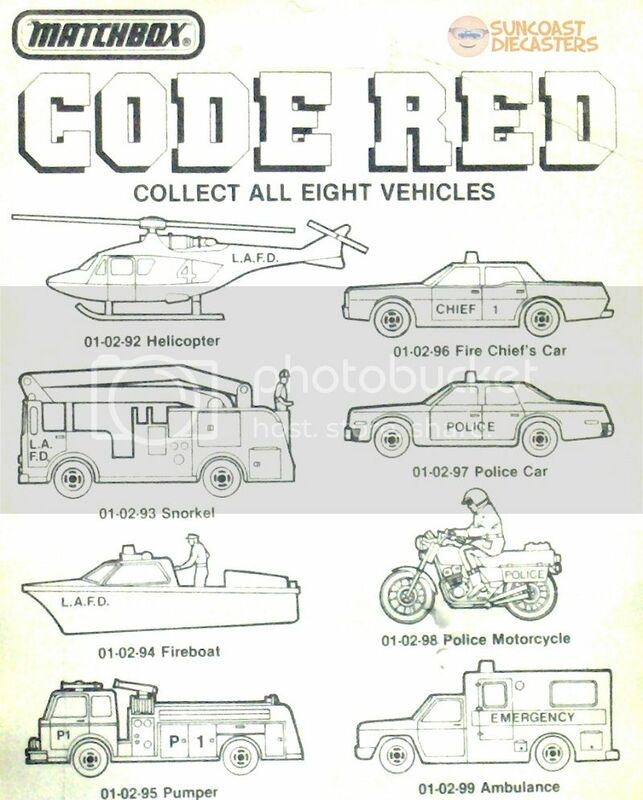 Bonus Image: The back of the Code Red card is basic, unbleached gray cardboard, illustrated with simple line drawings of the eight vehicles in the set. I was able to color-reduce it to black-&-white without too much loss or artifacting. By clicking the small image below, you can download the full-size image for your child to color. Hey, I got the April update updated while there’s still some April left! Victoryyyy!